Yiyili Aboriginal Community School sits on an excision of Louisa Downs Station, which is 170km south-east of Fitzroy Crossing and 120km south-west of Halls Creek in the East Kimberley region of Western Australia. As in other parts of the Kimberley, people were forced to leave the station when equal pay for Aboriginal workers was introduced in 1968-69. Many moved to towns like Fitzroy Crossing; some later returned to live in shelters on the edge of the Margaret River and were employed as fencing and mustering contractors. Yiyili Community was established in 1981. The community founders realised that for Yiyili to be a viable and sustainable community, educational facilities for the children were fundamental. With the same drive and initiative that had been used to start Yiyili, the community proudly opened Yiyili Aboriginal Community School in 1982. The school started in a bough shed and employed one teacher, with a caravan next to the bough shed serving as the teacher housing. In 1986, Yiyili was granted an excision allowing permanent housing and a school building to be erected. 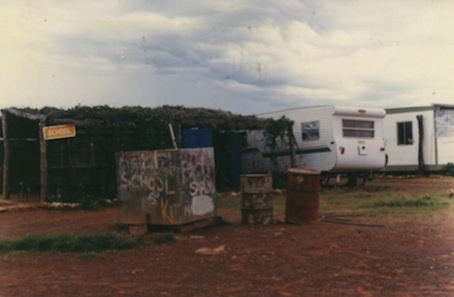 In the 1990s, family groups moved into their own communities to meet their own needs; now there are seven communities that are all part of one place and one country, Gooniyandi country. Ganinyi is the community next to the Louisa Downs homestead and was once a reserve for all Aboriginal people working on the station. Yiyili started in the early 1980s as an independent community. Girriyoowa (also known as Pullout) started around 1992 and is named after the spring on nearby Larawa Station - it is a milky waterhole or spring. Goolgaradah started in 1997 and takes it name from the Aboriginal word for Louisa Downs Station. Kurajan started in 1999 and is named for the billabong next to Mary River. Rocky Springs is also known as Thamani, the Gooniyandi word for the marble-like rocks that are a bit orange in colour. The community continues to play a central role in the school: the school is governed by a board made up of representatives from each of the seven communities and many community members work at the school in a variety of roles.